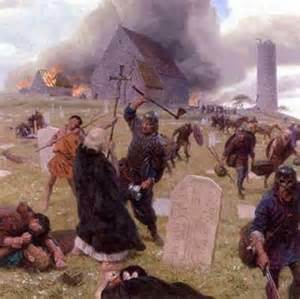 Viking raid on Lindisfarne - The world was introduced to the Norsemen (aka Vikings) in 793 when they swept down from the North and began raiding lower Europe. One of their first targets was the monastery at Lindisfarne in Northeastern England. The event is recorded in the Anglo-Saxon Chronicle. Over the next several centuries, the Vikings would become a major force in history, colonizing parts of Russia in the East and expanding frontiers to the West. Two of the most famous Vikings were Erik the Red, who discovered Greenland, and his son, Leif Erikson, who sailed to North America five-hundred years before Christopher Columbus. Much of what we know of Viking history comes from their sagas. In addition to their history, they are also famous for their mythology; and that is recorded in two works known as the Eddas. One is the Elder Edda which is poetry, and the Younger Edda which is prose.